In March I began to work with students and the tech teacher at Rockway Mennonite Collegiate to convert an S10 truck into an electric vehicle. We also worked at getting this project funded. This is ongoing. We are well on the way. After purchasing a 97 S10 we began to remove all the parts we will not need. We have the truck stripped and are doing some body work. We are almost at the point where we will install the new motor and transmission. Friday the motor will be attached to the transmission and then next week we can install it. In this picture you see the motor, motor mount, adapter plate, hub ( you can’t actually see it, but the flywheel is attached to it), flywheel and clutch assembly. It is all ready to attach to the transmission. I will post more about the installation of the electric components as we progress. The 4 students that are working on this project will not see the completion of the conversion. Students have already signed up to complete the project next semester. We hope to finish by Christmas, 2009. 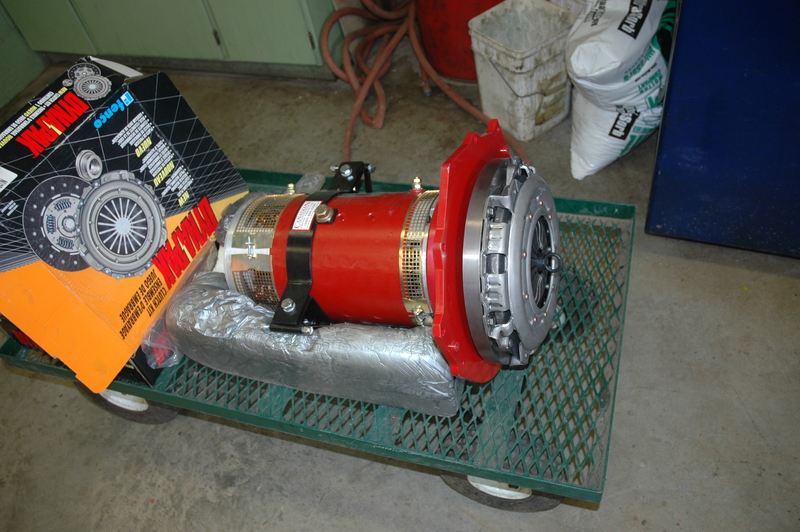 Our conversion parts were purchased from Canadian Electric Vehicles Ltd.
Stay tuned for more on the conversion process.